An on-going service project to help address the nutritional necessities of those in need began Wednesday at Southern Illinois University Edwardsville. SIUE has partnered with The Campus Kitchens Project, headquartered in Washington, D.C., to help address local needs, said Sarah Laux, assistant director of Community Engagement at SIUE’s Kimmel Student Involvement Center. SIUE students officially began Campus Kitchen operations on Sept. 10. 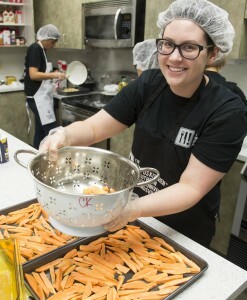 Founded in 2001, The Campus Kitchens Project (CKP, www.campuskitchens.org) is a national organization that empowers student volunteers to fight hunger in their community. On 37 university and high school campuses across the country, students transform unused food from dining halls, grocery stores, restaurants, and farmers’ markets into meals that are delivered to local agencies serving those in need. Each Campus Kitchen goes beyond meals by using food as a tool to promote poverty solutions, implement garden initiatives, participate in nutrition education, and convene food policy events. All Campus Kitchens are different and can vary, said Laux. SIUE’s model will involve volunteers picking up the food donations, planning a meal and then delivering the food to a designated partner. LaVista Community Supported Agriculture Farm in Godfrey has volunteered to give SIUE 100 pounds of produce each month. Food or monetary donations to the Campus Kitchen at SIUE can be used to supplement any meals. 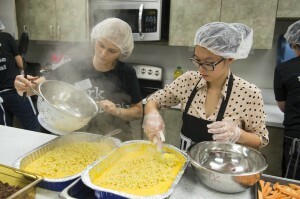 SIUE volunteers will prepare meals weekly in the catering kitchen of the SIUE Fitness Center. SIUE has currently selected Sunshine Cultural Arts Center in East St. Louis as its community partner. The Campus Kitchen at SIUE will deliver meals to approximately 50 elementary-age students on a weekly basis. Besides providing meals, SIUE will provide nutritional information, education and recipes. “We’re doing more than providing meals,” Laux said. “We want to supply them with good nutritional education. Also, the project focuses on sustainability. We will be taking food, which is of a high quality, but would have been wasted and putting it to good use. For more information about the Campus Kitchen at SIUE, contact Laux at slaux@siue.edu. Pictured on the left is Sarah Laux, assistant director of Community Engagement at SIUE’s Kimmel Student Involvement Center, who is working with Han Nguyen. Nguyen is a general assistant in the Kimmel Student Involvement Center. The two women are preparing macaroni and cheese. Stephanie Bargiel, an SIUE senior, is helping to cook sweet potato fries.